TOP: This 39-cm-long blue whale (Balaenoptera musculus) fetus was culled from its mother in 1936 at Port Hobron whaling station on what is now Kodiak Island, Alaska. The alcohol-preserved specimen is part of a collection of fetal whales acquired during the commercial whaling era and archived by the Smithsonian’s National Museum of Natural History. One by one, Yamato and paleobiologist Nicholas Pyenson, curator of fossil marine mammals at the museum, scanned 56 skeletal or ethanol-preserved whale fetuses at various stages of development to understand how underwater mammals—in particular, filter-feeding baleen whales, or mysticetes—developed their specialized systems of hearing. Pyenson and Yamato had access to 32 mysticetes and 24 odontocetes, or toothed whales, representing 15 species, most of which were collected by commercial whalers during the first half of the 20th century, though some came from bycatch or pregnant stranded whales. “It would be very difficult to obtain specimens like this now, partly because of the decline in whale populations as a result of whaling,” says Yamato. While impressive, the collection could have been much larger, given the millions of whales killed by the commercial whaling industry worldwide, Pyenson says; however, penalties associated with culling pregnant or lactating females likely deterred many whalers from turning in fetuses discovered during harvesting aboard whaling ships. “In many cases, those fetuses were just returned to the sea,” he says. 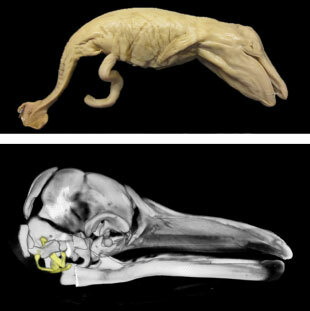 From the CT scans, Pyenson and Yamato were able to glean detailed physiological information without damaging the rare specimens. As a result, they have published the first in situ depiction of the development of a fatty structure called the acoustic funnel, which is found only in whale ears (PLOS ONE, doi:10.1371/journal.pone.0118582, 2015). 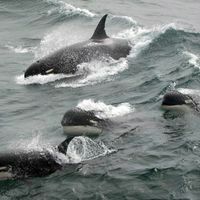 They found that the funnel points forward in toothed whales, such as dolphins and sperm whales, which need to hear at high frequencies and echolocate. The funnel in baleen whales, which hear at much lower frequencies and use deep infrasound to communicate, shifts sideways as they develop. 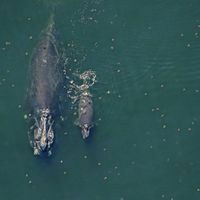 “That goes along with our understanding of the evolution of the head in baleen whales,” says Annalisa Berta, an evolutionary biologist at San Diego State University who was not involved in the study. The funnel’s orientation, she says, may have evolved to allow the baleen whale jaw to rotate to a position more favorable for bulk feeding.